After pickup from your Miami hotel, you’ll head to Vizcaya Museum and Gardens, perched on Biscayne Bay in Miami’s Coconut Grove neighborhood, one of the city’s oldest. Once the private winter residence of industrialist James Deering, Villa Viscaya is now a National Historic Landmark. Admire the villa’s gorgeous Italian Renaissance and Mediterranean Revival architecture, opulent European décor, beautiful gardens and lovely setting on Biscayne Bay. The house was designed to resemble a palatial Italian villa – a goal that was most definitely reached. The place is simply spectacular and preserves an interesting collection of European art and furnishings, all purchased by Deering on shopping trips through Europe. The house is surrounded by stunning gardens, including an orchid garden. 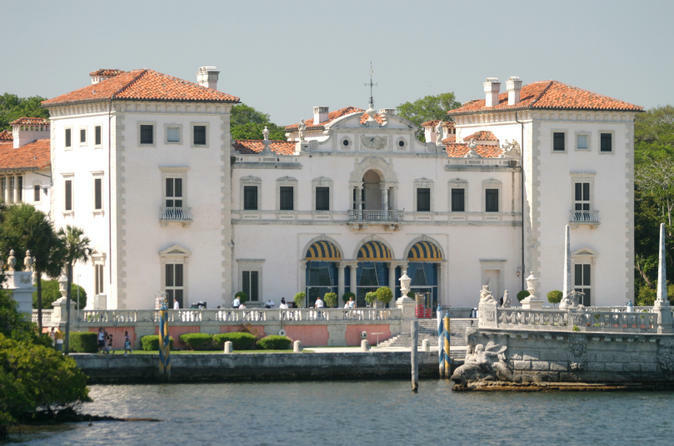 Vizcaya has been visited by some of the world's leading dignitaries, such as President Reagan, Pope John Paul II, Queen Elizabeth, and King Juan Carlos I and Queen Sofia of Spain. It’s also hosted important occasions, including the historic First Summit of the Americas with President Clinton in 1994.